Tedeschi Trucks Band Balance Being Partners In Music And In Life Susan Tedeschi and Derek Trucks of Tedeschi Trucks Band talk about deciding to make music as a married couple, relay parenting and channeling grief into art. 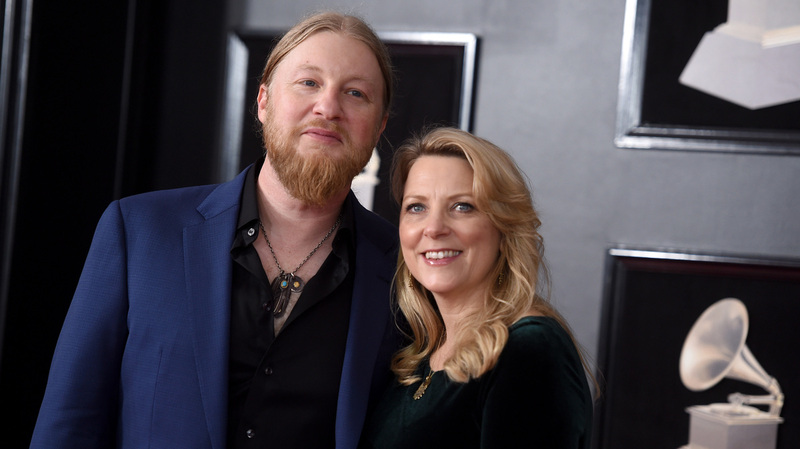 Derek Trucks and Susan Tedeschi attend the 60th Annual Grammy Awards in 2018 in New York City. The married band leaders are linked to some of the biggest names in blues rock. Their story started with The Allman Brothers Band, a legendary rock band that Trucks played with in the late 90's. At the time, Tedeschi was their opening act. "Derek actually had started with The Allman Brothers in June of '99, right around his 20th birthday, and I was 28." Tedeschi says. "I told him he was too young for me, but everybody knows he's an older soul than I am." For their first years together, Tedeschi and Trucks played in separate bands. They both, however, pursued a distinctive style of blues, a little more traditional, a little more pure than other artists. "We've been fortunate because we've been able to be incredibly stubborn, musically," Trucks says. "And it's still working." The couple's decision to merge their professional lives came after 10 years of being married and having two children together. During that busy decade before The Tedeschi Trucks Band formed, the couple remembers doing a lot of "relay parenting" while Trucks was in three bands, playing with The Allman Brothers Band in 2006 and Eric Clapton in 2007. "I mean, we both were a little nervous," Tedeschi recalls. "But if anything, we actually like each other better being around each other. We realized that because we've been on the road so much our lives, it was nice to not be on the phone so much and actually just be [together] in person." Trucks is now 39 and Tedeschi is 47; both are at an age when their older mentors such as Gregg Allman have been dying around them. Kofi Burbridge, the longtime keyboardist and flutist for Tedeschi Trucks Band, also died recently at the age of 57, passing the same day that Signs was released. Tedeschi and Trucks say these losses were on their minds as they wrote this latest album. "This record especially, I think more than anything we've done, happened in a time where there's just a lot in the air — in the world, personally and for the band." Trucks says. "All the lyrics were pretty raw and to the bone." Signs is out now via Fantasy Records.